By the late 1890s Sunbeam had made a name for itself selling high quality, relatively expensive cycles at Sunbeamland in Paul Street. This tradition would continue when the decision was taken to manufacture cars. Thomas Cureton John Marston’s right-hand man, Thomas Cureton, persuaded him to consider building a car. 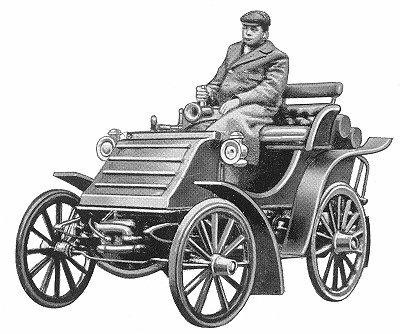 They drew up a specification for an experimental vehicle and work began on the prototype in 1899. The vehicle was built by Henry Dinsdale, an ex-Wearwell man and expert engineer, his assistant Harry Wood, then a boy, and other members of staff at a disused coach-house in Upper Villiers Street. Edward Genna looked after the office and would later become the company’s sales manager. They used a fairly conventional design with a 4hp. single vertical cylinder, water-cooled engine, two speed gear, belt drive, and tiller steering. Most of the parts including the radiator and spark plug were made at Sunbeamland or machined there from locally made castings. John Marston must have been very keen on the idea of building a car. Many of his friends pointed out to him that at his age (he was 63 at the time) he shouldn’t waste a handsome fortune on the new venture. On completion, a road test was organised. Dinsdale favoured the hilly route from Wolverhampton to Bridgnorth, whereas Cureton decided on a journey from Wolverhampton to Stafford, which was flat and included railway stations if necessary. They travelled at 14m.p.h., a speed that they carefully kept hidden from John Marston. 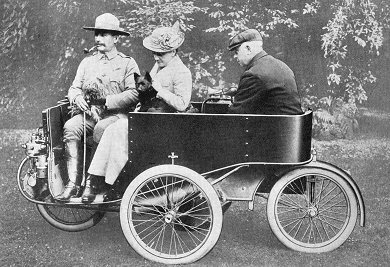 Sunbeam's first prototype car of 1899 with James Morgan in the driving seat. The company's second car, built in 1900. A second and similar car was produced in 1900 and exhibited at the National Show at Crystal Palace in December, 1901. Like its predecessor it was a two-seater, powered by a 4hp. single cylinder, water-cooled engine with a normal running speed of 700r.p.m. It had two forward speeds and a reverse drive to the rear wheels via an adjustable belt. It had tiller steering, a separate handbrake and pedal brake, and solid rubber tyres. They also built a third car of similar design that was produced in very small numbers and offered with either a 6hp. or 8hp. horizontal Forman twin cylinder, water-cooled engine. The four-seater car had a conventional steering wheel, three forward and a reverse gear, and a chain drive to the rear wheels. Wooden artillery wheels were used and fitted with Clipper-Michelin tyres. Another exhibitor at the 1901 National Show was Mr. Maxwell Maberley-Smith, who had produced an unusual car and decided to offer it to Sunbeam as a way for them to enter the car market without any development costs. Sunbeam accepted his offer and the Sunbeam-Mabley was born. The unconventional vehicle had four wheels, one at the front, one at the back, and two in the middle. It was shaped like an 's' sofa with a seat on each side facing in different directions, and powered by a 2.75hp. De Dion single cylinder, water-cooled engine. The engine, mounted above the front wheel, drove the middle wheels by a leather belt and chains. It had tiller steering on the front and rear wheels, pneumatic tyres and a drum brake on each driving wheel. A Sunbeam-Mabley with driver and passengers. The vehicles were built at a car workshop in Sunbeamland with about 50 staff. The car initially sold for £140 including tools, lamp and horn, and the price soon fell to £130. Production continued throughout 1902 and 1903, and about 130 were built. An advert from April 1903. A Sunbeam-Mabley in the Experimental Department at Moorfields in the mid 1920s. In the background is a 3 litre, 6-cylinder Sunbeam sports model. Courtesy of Jim Boulton. In 1901 Sunbeam displayed another car at both the Edinburgh Show and the National Show. This was a 6hp. ‘Panhard’ type with a body built by Forder, Wolverhampton’s famous carriage maker. It had many bought-in parts and excellent write-ups in the press, where it was described as “exemplifying high quality, with a steering wheel, and brakes of powerful character”. The twin cylinder 6hp. car had three forward speeds that were selected by a spring lever near the driver’s right hand. Also in 1901 a piece of land was purchased in Upper Villiers Street, next door to the Villiers Engineering Company. The land, previously belonging to Japanware manufacturer Edward Bullivant contained his garden and an old coach-house which now became the factory. It was extended by building a shed to house machine tools. The machines were driven from overhead shafting that came through the wall from the adjacent Villiers Engineering Company. The factory slowly expanded as galvanised iron buildings were added. The original entrance was at the side of Villiers’ building, along a passage and through part of a garden, where the employees would pick lettuces for tea. In 1902 Thomas Charles Pullinger joined the company as Work’s Manager, after working for several years on the design staff at Darracq and other companies in France. He persuaded Marstons to import partly completed 10/12hp. Berliet cars from France. Initially Sunbeam purchased the complete car minus the body and slowly purchased less and less of the car until only the engine, gearbox and sub-frame were imported. Ironically the car was first shown at the Paris Motor Show in December 1903. 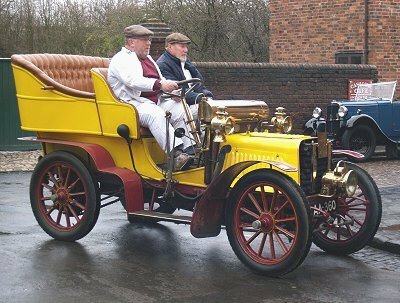 A 1903 Sunbeam with a Berliet engine, as seen at the Black Country Living Museum, Dudley with David Beere at the wheel and Stan Davis in the passenger's seat. The car that was entered in the 1902 London to Oxford Trial. 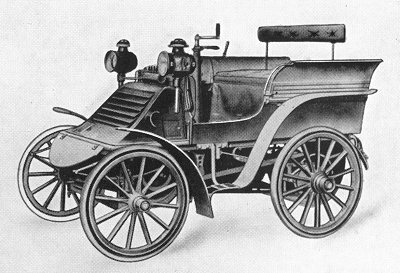 Sunbeam cars were entered in their first trials event, the 100 miles Liverpool Reliability Competition in February 1902 in which the company won the first prize, a gold medal. In November of the same year a Sunbeam car entered the London to Oxford Anniversary run and received the diploma, providing the company much coverage in the press. The following year Sunbeam entered cars in the London to Glasgow trial and yet again, good publicity followed. Even at this early date it seems that the company had already discovered the benefits that such events offered. 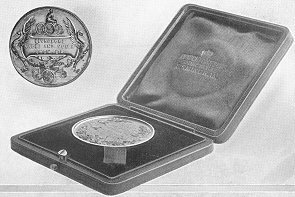 The gold medal won in the Liverpool Reliability Competition of 1902. 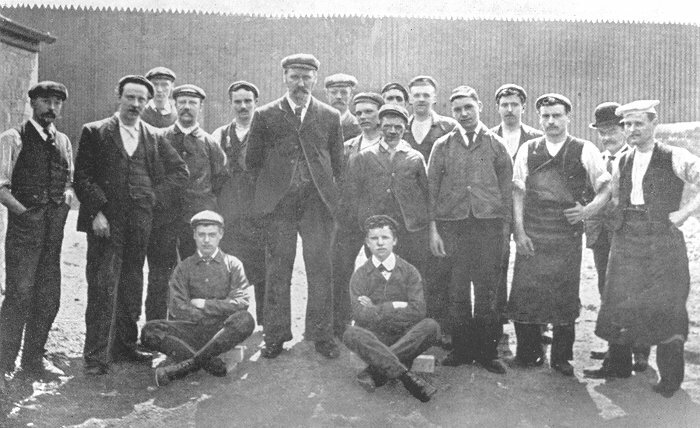 The staff in 1902. Henry Dinsdale is the tall man in the centre. A 12hp. 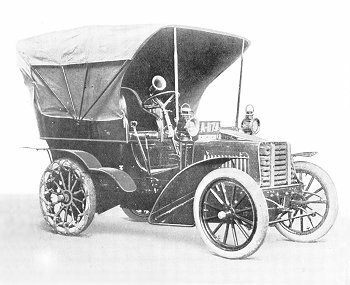 Sunbeam from 1903 with a Capecart hood. 1903 saw the introduction of the Pullinger designed 10/12hp. Model, powered by a 2.4litre, 4 cylinder, water-cooled engine, with a normal running speed of 800r.p.m. The engine was cast in two blocks of two that sat on a common aluminium crank case. It had a leather-lined cone clutch, four forward and a reverse gear, and a 1inch chain drive. A six gallon petrol tank was placed below the driver’s seat and the chassis was built on ‘Panhard’ lines with a central steel sub-frame carrying the engine and gearbox, and ash side members with a dumb iron at each end. Two Sunbeam 10/12s at Wrottesley Park, on 28th March, 1903. The one on the left is driven by Thomas Pullinger, with Angus Shaw in the front passenger seat. The one on the right is driven by Thomas Cureton, with John Marston in the front passenger seat. The car sold for 500guineas and was the first Sunbeam car to be fitted with their patent oil bath chain case. 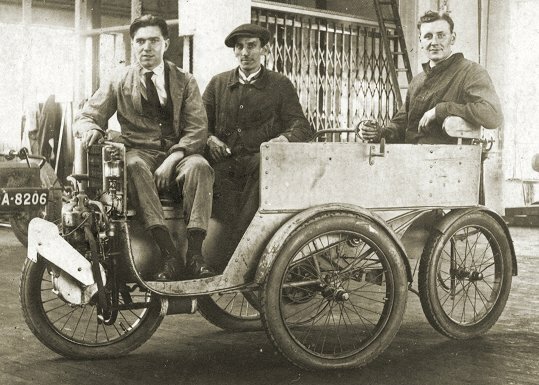 In 1904 the prototype was successfully driven in the John O'Groats to Land's End Trial by Fred Eastmead and 18 were built each month by 20 people. In all around 76 were built. An advert from 1903 with Thomas Pullinger at the wheel. Pullinger left in 1904 and moved to Humber. He was replaced by Angus Shaw. 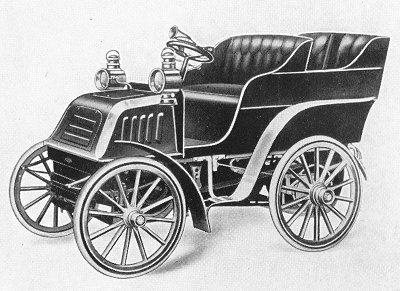 1904 also saw the introduction of the 16/18hp. model, which featured a 3.6litre, 6 cylinder engine. The cars sold quite well and it became necessary to re-equip part of the works to expand production. By 1904 a drawing office had been established and building work had started at Villiers Street. Because of the financial pressures this caused, it was decided to turn this part of the business into a separate company. 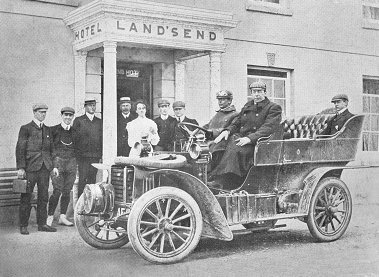 The 1904 prototype at the end of the John O'Groats to Land's End Trial. 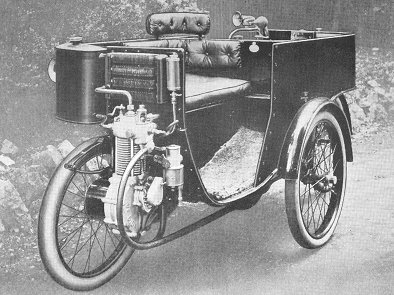 In October 1904 the first Sunbeam car fitted with a dynamo to charge the accumulators for the electric lights was introduced, and experimental work had started on a four cylinder 12/14hp. design.